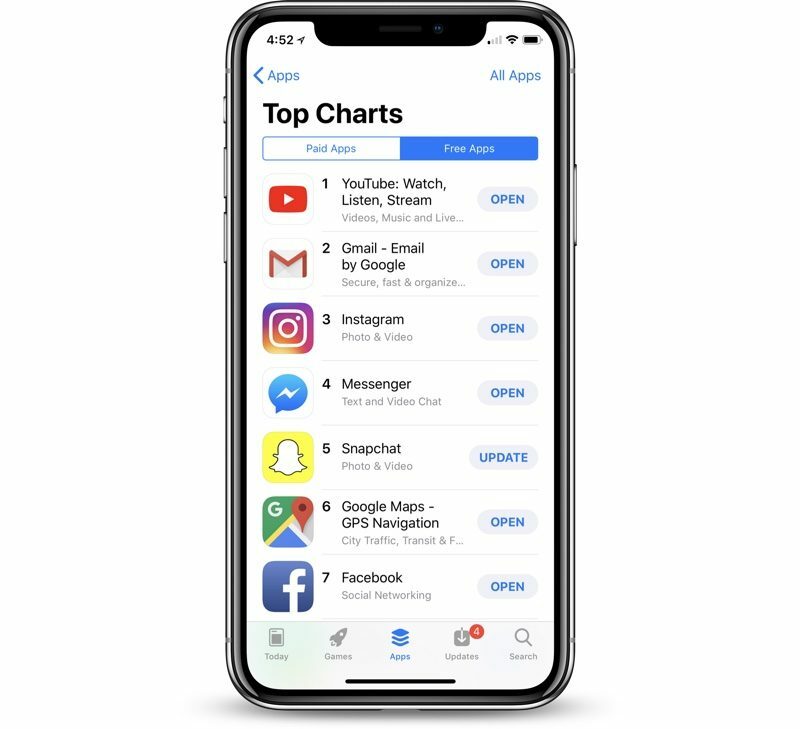 YouTube today achieved a milestone, becoming the Top Grossing Free iPhone app in the U.S. App Store for the first time, according to data app analytics site Sensor Tower shared with TechCrunch. Prior to today, the highest ranking YouTube had hit on the Top Grossing charts was #3, and the United States marks the first country where YouTube has reached the number one spot. YouTube has been climbing up the Top Grossing charts at a more rapid pace since the 2015 launch of YouTube Red, YouTube's paid service that provides users with ad-free videos, music, and exclusive content. YouTube Red is priced at $9.99 per month. Sensor Tower says YouTube grossed approximately $14 million in February of 2018, a 133 percent year-over-year increase from last year. In March, YouTube has already earned $12 million, with iOS revenue up 150 percent year-over-year. YouTube's App Store revenue does not include the money YouTube brings in through YouTube Music, YouTube Gaming, Google Play, rental purchases, or money. It's limited to YouTube Red and Super Chat, a feature that allow viewers to tip content creators during live streams. It's funny (or creepy) how Google tracks you through their services. The other day I searched on Google Maps for the phone numbers of the nearby Holiday Inn Express hotel and Crown Plaza hotel. Ever since then, my video ads (on any random video) have been for Holiday Inn Express and Crown Plaza hotels. Makes me not want to use Google products any more. It's back to Duck Duck Go. Mm how is Google doing that? Apple controls the App store. By reminding them that apps allowing saving of offline YouTube content violates Google’s TOS. I know some people like the YouTube t.v. platform etc. I view regular YouTube feed sometimes, and I am fine with that. The way that YouTube and Google inject tracking and ads everywhere is rather abhorrent to me, even though I can block most of it. Agreed. Never forget that with Google, you’re the product. I've been using DuckDuckGo for the last 4 or 5 years. Is YouTube Red going to cover the ad insertions that Google announced today? Or is that a new higher tier charge on top of YouTube Red? This made be curious so I looked it up and the Youtube/Google employee said exactly that is being done to “frustrate and seduce” users into subscribing, no Google this simply makes me want to go out of my way to find even more workarounds for your crummy ads. With how they bully 3rd party YT apps off the App Store I wonder how long until they start doing shady **** to prevent Android devices from being able to run similar apps. I wonder how many requests/demands they send to Apple weekly to remove the background video playback feature in iOS. It’s in safari not google for me. I search for a sim card pop freedom for my parents. Every website or forum I go that has ads shows pop freedom. It’s been going on for 3 weeks now. That's because search is powered by Google. now if they can include a privacy respecting no tracking option with that YouTube Red maybe I consider seriously signing up.